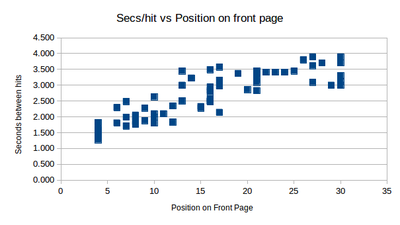 So I ended up with data on page hits, points, and ranking on the front page. Not really sure what to do with this data, but it seemed a good idea to plot it and see if there was anything to be seen. We can see plots of the three values, with time running across the bottom. Times are BST, or GMT+1. The item was submitted at about 10:40, but I didn't start recording the position on the front page until 11:15, because that was when I first realised that the item had, in fact, got some attention. 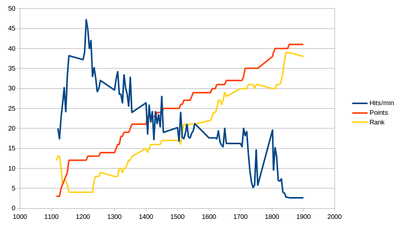 We can see fairly clearly that the ranking (in yellow - inverted on the chart) gets to number 4, and then gradually declines. The points (in red) climb fairly steadily until the item falls off the front page at about 18:45. 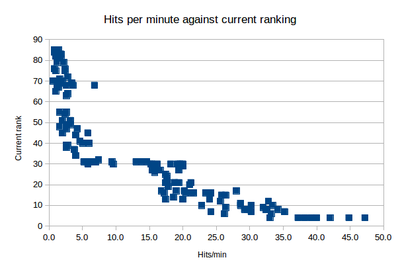 Unsurprisingly, the hits per minute are roughly correlated with the ranking. 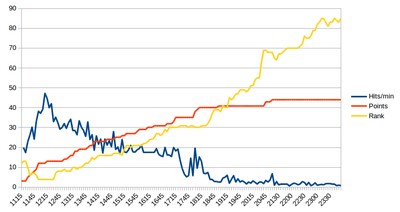 The higher the ranking (lower the yellow line) the more hits per minute. This is especially obvious at about 17:30 when the item dips briefly off the front page. There's an immediate drop in page hits, and then when the item touches back into the front page the hits return, until the item again, and permanently, falls off the front page. The second version of the plot shows that correlation much more clearly. There's a spike in page hits at 17:30 when the item first returns to the front page, then again on its last visit at about 18:05. This shows even more clearly the value (in page views) of getting to the front page of HN, as compared with just being on the "newest" page. The correlation is unmistakable when we view the data as a scatter plot of page ranking versus hits per minute. The split in the plot at the ranking of 30 is blatant and unmissable. When the ranking is worse than 30, hits/min is generally below 5, whereas 30 and above and the hits/min is never below 15. Total number of page views was around 15.5k, almost all unique IPs. At about midday the page was getting a roughly a view per second.